It’s fun to mix and match stuff you get from us at The Interior Gallery with items which you already have. There are lots of sites out there which can help you out with DIY bedroom furniture makeover ideas or bedroom decorating ideas. HGTV.com is one such site so do pay them a visit if you have the time. We were featured on HGTV a while back in the BATHtastic segment. Here’s the video in case you missed it. You’ll be amazed at what you can update with a little bit of paint and a few display tips. With some imagination, you can creatively match existing furniture or decor with items which you have just purchased from us. This helps keep expenses low and allows you to redecorate more rooms in your home. Dolciana Velvet Bed with Italian Fabric and solid wood hand-carved frame. This item is the Dolciana Velvet Bed. We have this in King Size. What a beautiful bed. The frame is carved from solid wood and that fabric you see is Italian. That’s luxurious elegance defined right there. Do you have $6500 to spend on it? No? Well, fortunately, it only costs $1600 at our store. As far as discount modern beds go, this one is a bargain. If you like the luxurious feel of velvet on your skin, and a design which is stylishly contemporary, the Dolciana Velvet bed is for you. And, by the way, the gold leafing is you see hand-applied. For more modern discount bedroom furniture Ideas, do drop by our bedroom furniture page. Here’s wishing everyone a happy Thanksgiving! We’ve been in the news a lot lately. There’s been lots of coverage about our products and we’ve added a few more videos to our online video channels on YouTube, Dailymotion and Vimeo. We’ll be adding more just as soon as new products arrive. 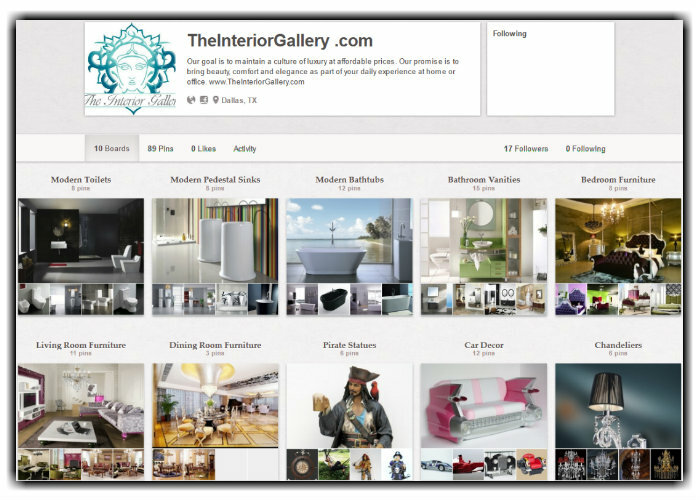 Just a reminder, we also have loads of images on our Interior Photo Gallery Pinterest page. Do feel free to browse and re-pin them.